Ask for Help -travel agents itching to assist! Momentum Multiply is a rewards program of Momentum Health, which also offers discounts on inter alia Virgin Atlantic flights, car hire, African Pride Hotels and Protea Hotels. 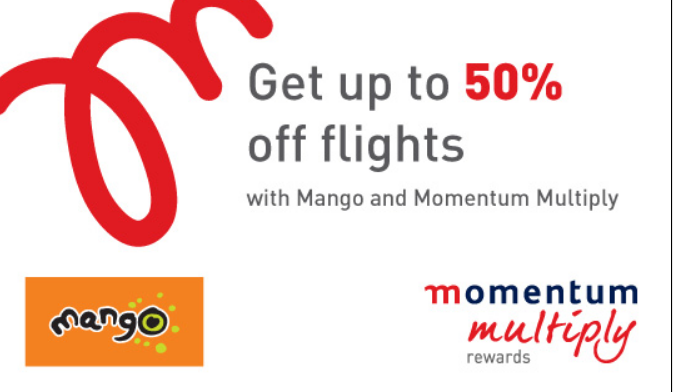 Discount your Mango Airlines flights by entering your Momentum Multiply client number when booking a flight. You could get up to 50% discount on flight prices (excluding airport taxes, fuel levies, insurance, etc). Muliply Premier Private Club members can get up to 50%* discount on Mango's flights (excluding airport taxes, fuel levies, insurance, etc.). Platinum Members can get up to 40%* off, Gold Members can get up to 30%* off, Silver Members can get up to 25%* off and Bronze Members can get up to 20%* off. Multiply Starters can get up to 7,5%* off and Multiply Providers can get between 10%* and 15%* off depending on their level. This is only applicable to leisure travel bookings made on Mango's website. *Discount is only on the airfare and excludes airport taxes, fuel levies, insurance, etc). 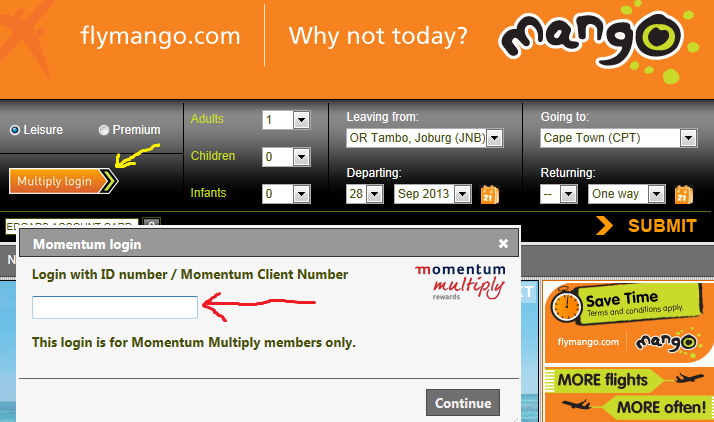 To book, log into Mango Airlines' website using your Momentum Multiply login. Or email multiplytravel@momentum.co.za or phone 0861100155 (you'll incur a flight bookings charge if you email or phone). Mango Airlines sometimes runs flight specials which are solely for Momentum Multiply members. This sale, which was on 30 Jan 2014, was on selected flights up to 28 Feb 2014; and excluded weekends, specials events and peak times. Johannesburg to Durban from R499* was an exceptionally low airfare, when you consider that the Happy Day Sale in the same week offered the route for R575*. Click here to see the full list of Mango flight specials.